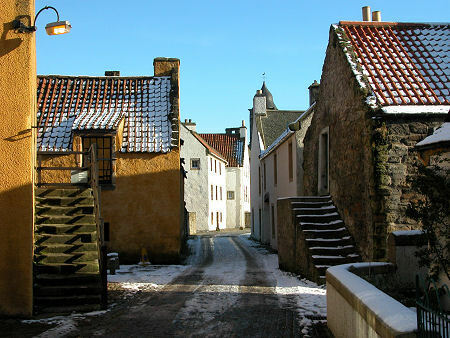 Culross: avoided by Balfour and Breck, but an unmissable part of this walk! As far as we know this is a walk that doesn't exist: yet. The aim of this page is to stimulate discussion with a view to developing a practical walk following something like the line taken by David Balfour and Alan Breck between 27 June and 25 August 1751 in Robert Louis Stevenson's classic novel "Kidnapped" (which you can read on Undiscovered Scotland here).The French have their "Le Chemin Stevenson" following the route RLS took with his donkey: we Scots should have our own "Stevenson Way". A very rough approximation suggests that this walk would would be some 230 miles long, taking in some of the very best that Scotland has to offer. Please remember that the walk described below has not yet been walked by us: and may not even be walkable in this form. We would very much like your views, your experience, and your feedback: and perhaps between us we can turn the Stevenson Way from a half-baked idea into a practical proposition. Please send ideas, comments or views to us at email@undiscoveredscotland.co.uk Comment received from others about this potential walk have been added as a separate notes page, attached here. Since this page was originally written Ian Nimmo has published a book on what he calls the Kidnapped Trail. His focus, after 40 years trying to resolve the issues, is on the likely route that Balfour and Breck would have taken: and on the Appin murder. His book is essential reading to anyone interested in this walk. In a more recent development, Ian Logan has established a Stevenson Way website at www.stevensonway.org.uk as part of a project which it is hoped will turn a theoretical walk into something much more practical. The brig Covenant was wrecked on rocks close to tidal Erraid Island, off the south-west tip of Mull. Erraid, though tidal, therefore really ought to be the starting point. And the other end? 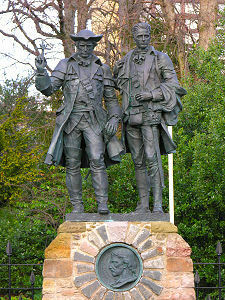 How about Corstorphine Road in Edinburgh, at the larger than life size statue of David and Alan which form part of a memorial to Robert Louis Stevenson. This faces the road from the grounds of the HQ of Scottish and Newcastle plc, not far from the Murrayfield Stadium. Erraid can be reached on foot at low tide, but we've yet to establish for how long. 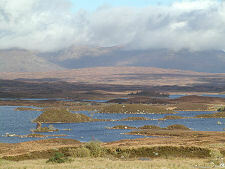 Ideally the walk ought to include a landfall on Erraid: preferably with a visit to Cnoc Mor, the islet's highest point. You can find out more about Erraid from the Community Site for the island. Then the length of Mull needs to be traversed. David Balfour wandered considerably during his fictional crossing of the island, but he probably followed roughly the line of what is now the main road as far as the head of Loch Scridain from Fionnphort through Bunessan and Pennyghael. He could then have carried on along Glen More; or diverted to the south along the coast via Carsaig, Loch Buie and Loch Spelve, or trekked north via Loch Ba or Glen Forsa through the mountains. 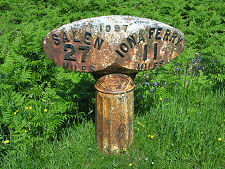 Whatever the route, the end point was the "Torosay Ferry". It's easy to suspect this had something to do with Torosay Castle, near Craignure; but it seems most likely that the ferry in Stevenson's day (and in 1751) crossed by the shortest route from somewhere near Fishnish, also home to the modern ferry to Lochaline. Cetainly is seems a good objective to mimimise the amount of walking on the island's A-roads, which can be busy and are mostly single track. 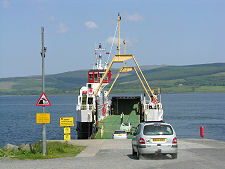 David Balfour's ferry landed at Kinlochaline, and from there he probably took the line of today's A849 and B8043 to Camasnacroise near Kingairloch. From today's ferry terminus at Lochaline, the first couple of miles along the main road seem unavoidable, but a right turn at Kinlochaline takes you past Ardtornish and on to a track that heads along Glen Sanda to Loch Linnhe at Glensanda, before continuing up the coast to Kingairloch. On the map this looks great: in practice it might bring you closer than you want to be to one of Europe's largest quarries at Glensanda. 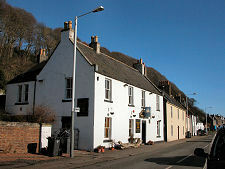 From Camasnacroise, David Balfour sailed directly across to the mouth of Loch Leven, an option not available to us today. The next few miles are problematic. 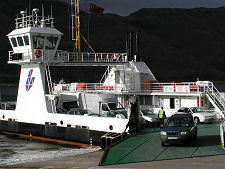 How do you get from the Corran Ferry to the Ballachulish Bridge without walking alongside, or still worse on, the A82? Ideas for alternatives gratefully received: is the shoreline walkable here? 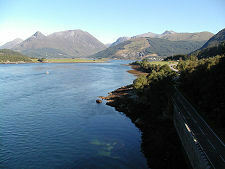 From the south end of the Ballachulish Bridge the steps are taken up to the monument marking the site where James Stewart was innocently hung for the Appin Murder. A mile to the west is the memorial marking the site of the murder itself. We then suggest a route that heads south west before curving east through Glen Duror around the back of Beinn a Bheithir to Ballachulish. 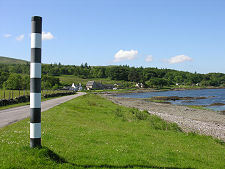 A number of the sites associated with the Appin Murder are linked into what is known as the Last Clansman Trail. The route should include a visit to the memorial at the site of the Appin murder itself. In Kidnapped, David Balfour and Alan Breck take a remarkably mountainous route which may reflect RLS's desire to tell and adventure story and a lack of familiarity on his part with the severity of the country in the area. Things then get a bit more sketchy. A large rock with a flat top features as a hiding place in Kidnapped, probably in Glen Coe. This is probably fiction, based loosely on Signal Rock in Glen Coe. There is then time spent at the "Heugh of Corrynakiegh", described as a cleft in the head of a mountain, complete with running water, a wood of pine and birch and a cave. Ian Nimmo identifies this as the Heugh of Coire na Ciche on the north east flank of Loch Leven's trademark mountain. 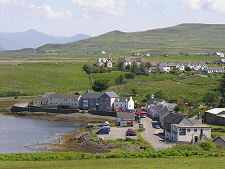 The hamlet of Caolasnacon does appear as itself, if rather smaller than suggested in the book. From here Kidnapped gets sketchier still, the next fixed points being Rannoch Moor and "Cluny's Cage" on the flanks of Ben Alder. We therefore suggest a route to Kinlochleven, ideally avoiding the B863, then up the north side of the River Leven to the Blackwater Reservoir (which would not have been here in 1751). Then to the south west end of Loch Trieg along Gleann Iolairean; and on to the west end of Loch Ossian, which is followed to its north east end. We then propose the path climbing north east following the Uisge Labhair, then climbing south east to pick up the path through the Bealach Cumhann as far as the bank of Loch Ericht at Benalder Cottage. 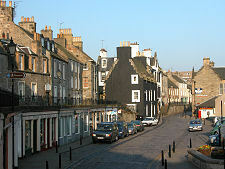 The OS shows "Prince Charlie's Cave" nearby. No cave exists here, and it's thought this may be an early typo for "Cage", and that this is the site of Cluny's Cage referred to in Kidnapped. Then it's back down to the southern end of Loch Ericht and south to the west end of Loch Rannoch. The next section of the route in Kidnapped was intended to take Breck and Balfour over the tops of the mountains and around the heads of Glen Lyon, Glen Lochay, and Glen Dochart, before descending to cross the River Forth near Kippen. They actually got as far as Balquhidder. The "correct" route is probably therefore a high level one, and it is possible to pick a route heading south from Bridge of Gaur and taking in Meall nan Aighean, Meall Cruinn, Beinn a Chuirn, Beinn nam Fuaran, Beinn Chaorach, then south to Crianlarich. Weight of pack, the stalking season, and weather may all argue in favour of a low(er)-level alternative. One that suggests itself is as above to Meall nan Aighean, but then descend south east to the end of the track alongside Loch an Daimh, then follow the road west along Glen Lyon. From the west end of Loch Lyon it would be possible to go up Strath Tarabhan and down the Auch Gleann to pick up the West Highland Way and then on to Tyndrum and Crianlarich. From Crianlarich the route would go east for a short distance before taking Benmore Glen south to Inverlochlarig Glen: then east along Loch Voil (probably the north shore) to Balquhidder. Balquhidder to Strathyre takes in the west side of the valley, keeping well away from the A84. Stevenson then talks of an easy stage over the mountain "Uam Var" before descending to the Allan Water. The best fit seems to be with Uamh Mhor, a southern outlier of Uamh Bheag before descending to Dalbrack and down a minor road to Dunblane, then on to Bridge of Allan. The route from Strathyre to Uamh Mhor is less obvious: all ideas gratefully received. It's almost tempting to conclude that Stevenson shouldn't be followed too closely here and head east from Balquhidder to the South Loch Earn Road, then head south down Glen Vorlich. A further alternative might be to follow the cycleway from Strathyre to Callander, then the line of the River Teith past Doune to Stirling. However you look at it, this section of the walk needs much more work. 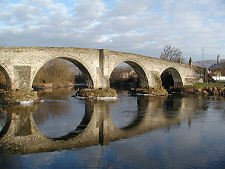 The next fixed point is the old Stirling Bridge. Then you head east, again in need of good pedestrian friendly paths, to Alloa, Clackmannan, Kincardine, Culross, Limekilns, Rosyth and the Forth Road Bridge before passing Queensferry en route to Edinburgh via Corstorphine Hill. This is potentially a superb walk: but the emphasis has to be on the word "potentially". There are a number of very vague areas, and others where a lot of work is needed to find a route clear of main roads. Othere parts cover very long distances in very remote areas, where accommodation and shops are thin on the ground. Since our Stevenson Way feature first appeared in December 2002, an excellent book by Ian Nimmo, who's been interested in the route (and the Appin murder that lies at its core) for 40 years, has been published. It is an indispensible read for anyone thinking of following the route: Walking with Murder: On the Kidnapped Trail: Ian Nimmo. Meanwhile Ian Logan has established a Stevenson Way website at www.stevensonway.org.uk as part of a project to turn the walk into a practical proposition. The walk was officially launched on 5 May 2012 and a page of images from the launch can be seen here. Earlier comments received from others about this walk have been added as a separate notes page, attached here. Maps: The Ordnance Survey 1:50,000 maps of the areas crossed by the Stevenson Way are Landranger maps 48, 49, 40, 41, 42, 51, 50, 57, 58 and 65. Mull is Larger than You Expect!